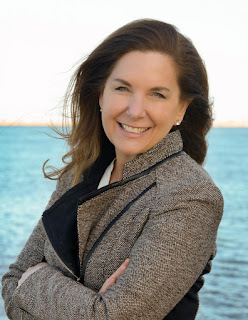 Sea, Sand & Sky: Crabs, Moon jellies, and Striped Bass! Oh my! 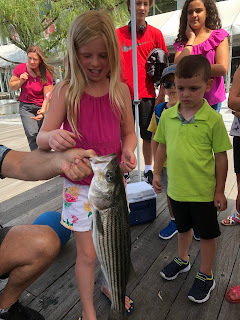 This is my fourth week at the Boston Children's Museum and this Tuesday we caught our second striped bass!! Oftentimes our most exciting catches come from the crab trap. We will get green crabs, spider crabs, cunner fish and baby flounder fish. The only thing we really catch on our fishing rods are crabs. 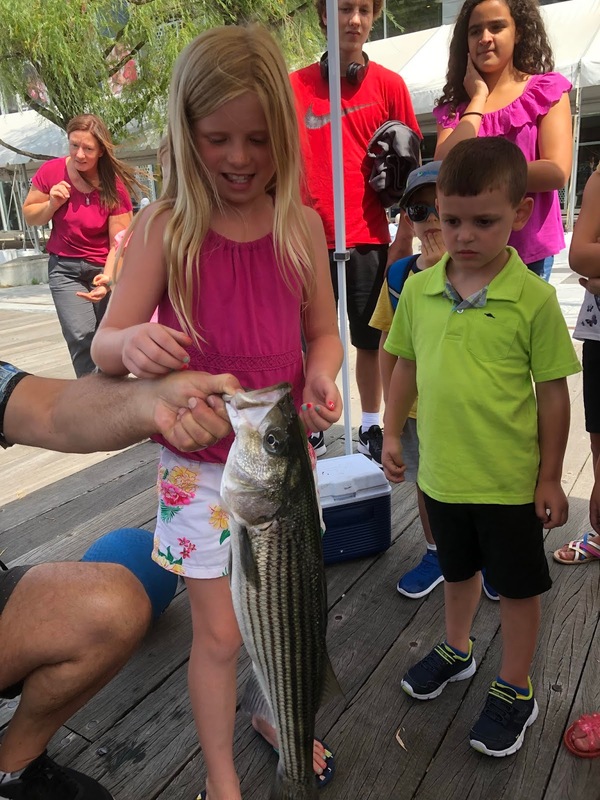 Parents, or the adults responsible for the kids, often ask us what we are fishing for and we say anything that will bite but realistically we almost exclusively catch crabs, but this makes it even more exciting when we catch something other than crabs. It was a regular Tuesday day at the Boston Children's Museum. It was a toasty day with the temperature wavering between high 80's to low 90's with a high percentage of humidity. Luckily we had a tent to protect our touch tank from the sweltering sun, as well as ourselves! The first half of our shift (10am-1pm) was a bit slow, with less than 60 visitors. The second half was very busy. We had several camp groups come through, all eager to fish and test their luck. There were kids at each pole but then, one young girl, just nine years old, started to feel a particularly strong tug. We saw the pole started to bob up and down. Imani quickly rushed to assist the girl reel up the rod but it still seemed too strong for both of them. I decided to try and steady the line by grabbing it so Imani could reel it in. Even that was difficult! This fish was a fighter. 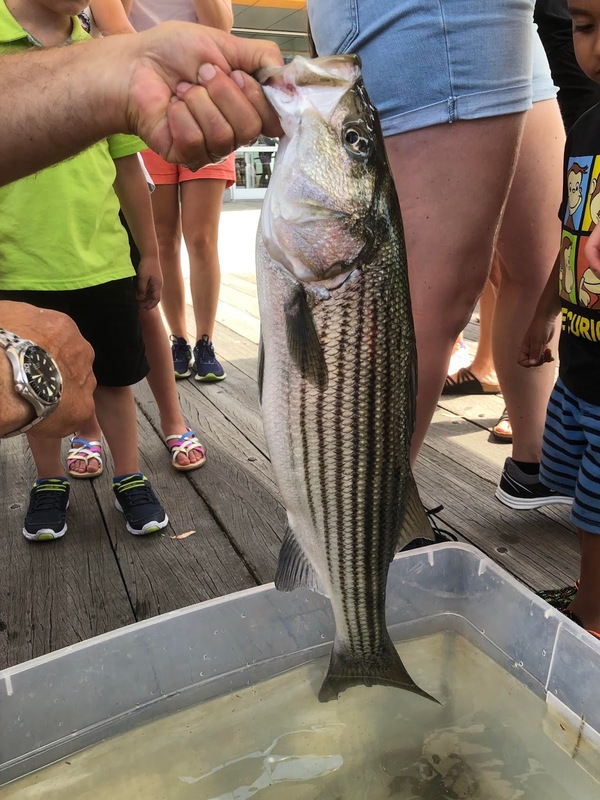 Eventually we were able to lift the fish from the water and into the touch tank. It was 25 inches long!! 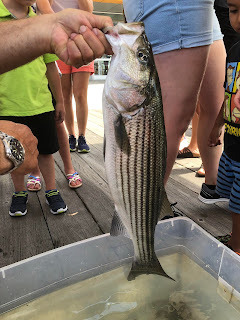 Our tank was not big enough so we had to let it go soon after we caught it but not before dozens of people ran over to check out our latest catch. I hope to catch more fish soon! It truly is an exciting time for the people at the BCM.